In the military we have to be as efficient as possible because we work with taxpayer’s money and there is a lot of work to be done. The workload on some postings can be quite extreme and I have had tours that are no exception; I have worked genuine 12 to 16 hour days in my career for 5 days a week (or 7 days a week on ops, which, of course, is entirely to be expected). Now, I get that people in civilian life also work long hours (and rightly so if combined with the appropriate remuneration) but when you have long hours mixed in with flying a £20 million aircraft twice a day – that’s when you realise the value of the 90% solution. So, here’s the deal. Your boss sends you a document attachment on email. Firstly, it is quite good to remind people that email is ’email’ and not ‘immediate’ mail – sometimes you aren’t able to respond within 20 minutes (especially when I’m flying). Maybe put in your signature block something that says that you only look at email at 1100 and 1600 and then get yourself involved in really connecting with people like talking to them face to face over some tea, maybe. So, you have the document from the boss and he’s asked you to précis it for him before tomorrow; the issue being that when you open the document you realise that it’s a 100 page long freaking nightmare and it’s ‘late o’clock’. The 90% solution means that you don’t bother with a detailed read, just skim-read it and get it back out; don’t invest too much time on it as the truth is your boss won’t either. Unless you are an artist with a significant amount of time to wallow in your own narcissistic indulgences, you will probably find it hard to accommodate all of the tasks you have to complete. One of the major issues of the modern workplace is that it is full of bosses that do two things: they accept every tasking from higher authority without reservation and they delegate far too expeditiously and without restriction. We’d all probably do the same in their position too but, as a worker, we need to have a system that can get that work done without the 12 hour days – and the 90% solution is just that. If you have the same routine task coming in every so often you can make it into a simplified process and write it down. For instance, when the squadron was first starting up we had 3 or 4 VIP visits per month. This became totally overwhelming and young instructors that should have been perfecting their core skills in the air found themselves writing instructions for the visits – a time-consuming task. The instructors soon found similarities in these visits and started to develop processes to ease their workload. They made a template that had everything necessary for every visit already completed; all they had to add were the names, dates and times, print it out and send it. They got very efficient in achieving the small amount of work that really mattered to deliver the 90% solution. They were then able to go flying again which made them more confident and experienced – two essential requirements for keeping young jet pilots alive. This leads me on to another core principle that has saved me a huge amount of time over my career – the 80/20 or ‘Pareto’ Principle. The Pareto Principle was first defined by an Italian economist called Vilfredo Pareto who, in 1896, recognised that 80% of the land in Italy was owned by 20% of the population; he was at university and being all creative like academics are sometimes. In some businesses it is found that 20% of sales account for 80% of profit, that 20% of motorists account for 80% of accidents and 80% of a company’s complaints come from 20% of its customers! If you can identify the 20% of the work that you do that causes 80% of the results then you can use the remainder of your working time more efficiently thus saving considerable time and effort. For example, when you go into work, you probably have a list of tasks in mind that you need to complete that day and you probably allocate time for them all (even subconsciously – ie. I’ll do that phone call at midday for 30 mins etc). What the Pareto Principle says is to look at your day and find the core tasks that are the most important to achieving the biggest outcomes and hit them hard, putting the other tasks to the bottom of the list. By doing so you will achieve 80% of what you are supposed to achieve. One good way of proving this theory is to just not do a low level task that you have been assigned and see if anyone notices – chances are that the task was a throw away comment from your boss and will be forgotten about in a day or two anyway. So, if we apply the law and look at what we do that really achieves the most of our outcomes we might be able to free up time to invest in relationships – maybe talking face to face with people instead of ‘immediate mailing’ sorry, emailing. Ok, let’s just try and remember the Iceman quote in Top Gun – it was there for a reason. That’s me, yes I fight a boring fight – I’m no ‘Maverick’ but I’ll take 5 or 10 degrees of angles off you on every pass. They are very small wins but they will all add up over the next 60 to 90 seconds (yes, fights don’t take very long). I let the other guy be a hero and try something new – I’ll just stick to my 20% that makes the 80%; I’ll be boring and just grind my opponent down. I will assess the energy of the other jet, gauge their ability to get their nose onto me and slowly attempt to manoeuvre into their ‘control zone’. Think ‘The Rumble in the Jungle’, George Foreman against challenger Muhammad Ali, in 1974 in Kinshasa, Zaire – arguably the 20th century’s greatest sporting event. Ali employed a ‘rope-a-dope’ tactic and stayed totally submissive whilst being battered by the younger Foreman. This allowed Foreman to tire and let Ali deliver his effort at the end of the 8th round to devastating effect. Sometimes a little deception also goes a long way for a fighter pilot when they combine it with the Pareto principle and work to the 90% Solution. The German WWI flying ace Manfred Von Richtofen or the ‘Red Baron’ was not the most talented pilot in his air force but he worked out his ‘20%’ that allowed him to chalk up 80 confirmed kills. Unlike his younger brother, Lothar (40 kills), Manfred refrained from using risky or aggressive tactics but would dive out of the sun and, with his squadron mates protecting his 6 o’clock, shoot down the enemy aircraft before making his escape. He would employ a set of rules that had been crafted and distilled down from the experience of his friend and pilot mentor Oswald Boelcke called the ‘Dicta Boelcke’. In the same way that I have some simple rules to fall back on, the ‘Dicta Boelcke’ gave 8 tactics that should be followed in order to achieve success in any aerial engagement. These rules were the 20% of causes that gave 80% of the effects or the Pareto Principle applied to First World War air combat. So, unless you are an artist creating your next masterpiece, just go for the 90% Solution in the workplace and avoid analysis paralysis – you’ll get significantly more done. Look to see what is the 20% of what you do that gives you 80% of the results and remember that, just because someone makes something look easy, they’ve just come up with a process that lets them concentrate on the small amount that creates the most value. 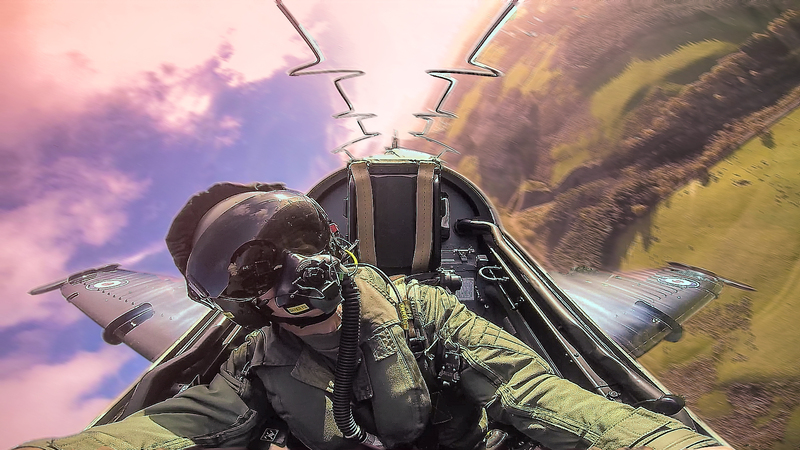 Squadron Leader Tim Davies is one of the most experienced fast-jet flying instructors in the Royal Air Force. He spent time on operations as a Tornado GR4 pilot serving over Iraq in Op Telic and has spent time on the ground with the US Army in Kabul, Afghanistan. Until very recently he was responsible for all instructor and student training on the Hawk T2 in the Tactical Weapons phase of their training. He is now the Squadron ‘Uncle’ bringing experience and mentorship to both staff and students and has over 2500 flight hours.